For the past five weeks, each Wednesday night, I've been opening my home up to six amazing women. Most never knew each other five weeks ago. Most I only knew a little bit through different connections. Now, I count these women as my friends and feel so blessed to have gotten to know them. But first, let me back up on how I ended up opening my home up to these women. In January, I randomly mentioned to Chris one day that I felt as if I should maybe open my home up and lead a Bible study. He looked at me like I was a bit crazy and then said, "Are you sure? That really isn't your thing!". I knew exactly what he meant. I am by nature, not a hostess. I like to spend time with people, but I am much more of an introvert than an extrovert. But I could not get this idea of a Bible Study out of my head. 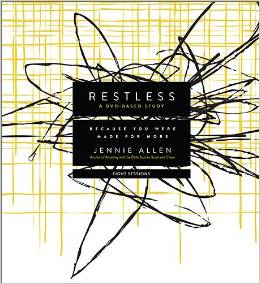 Chris asked me what Bible Study I would use, and the first one that popped into my mind was of this new book I had only heard of, Restless by Jennie Allen. I've followed Jennie's blog for years as we both have adopted children and in the adopted world, you feel connected knowing someone else has been through the same thing as you. I believe though it was the name of the book that really drew me in. I mean, how long have I felt Restless? Years! So, I had this idea floating around in my head of hosting a Bible study, yet I wasn't quite brave enough to put it out there. Then, in February I was able to attend our local IF Gathering and hear Jennie speak. She was amazing and her words really spoke straight to my heart. Still though...I couldn't possibly host a Bible study! It was SO out of my comfort zone. My house isn't completely finished, I'm busy enough, I live too far out in the country for anyone to want to come to my home...and the list of excuses went on. Funny enough, God knew that He wanted me to do this, and within days of the IF Gathering I was contacted asking if I would ever want to review Jennie Allen's book Restless. I knew then that I should do this. So one day I found myself asking on my Facebook if anyone would want to join in on a Bible Study at my home. To my surprise, lots of people were interested! It ended up being that we had six who could show up pretty regularly. I don't know if I can fully put into words how much I needed this study. To gather with women each week and to hear God speak through Jennie's words. I'm honestly looking at this world and my specific role in it much differently thanks to God working in Jennie. I'm not going to ruin the study or book for you, but I would highly encourage you that if you can read her book, or even host a study, do so! Also, check out this video in order to get a "feel" on the study!